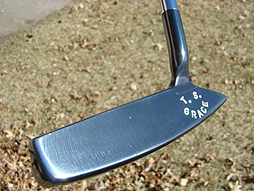 T. S. Grace, Heart model. 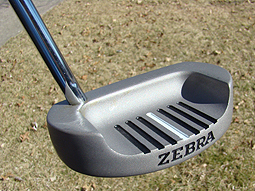 This is a handmade prototype, made by Bobby in the mid-1990's. 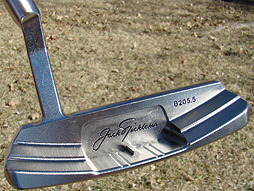 According to Bobby, about 75-80 were made. This comes with a leather T. S. Grace grip and buffalo vinyl T.S. 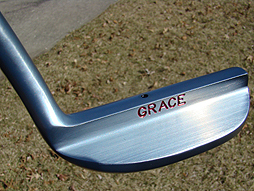 Grace headcover. Mint condition. 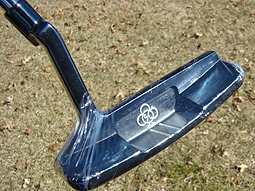 According to Bobby, this was a Spade model, although the Spade is not stamped on the club. Bobby believes he made 25-30 of these. Bobby believes about 150 of these were made. 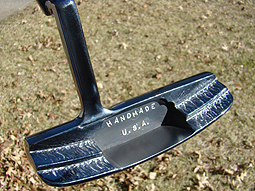 Hand-stamped Scotts on one side and Dale on the other side. 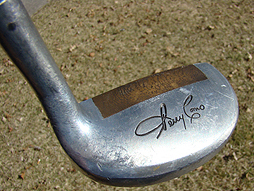 Bobby said two such prototypes were made, with this one having been used by Davis Love III. 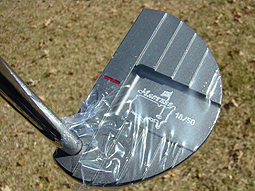 Made for two-time Masters' champion, Jose Maria Olazabal. 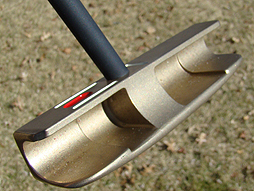 The paint fill for this putter is in yellow and red to match the Spanish flag. One of two made. 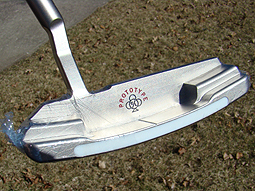 This is a very unusual handmade prototype made by Bobby Grace/MacGregor. 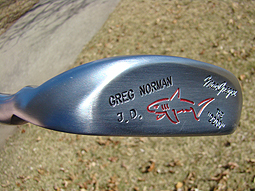 It was originally intended to be used by Greg Norman but two of these were made for John Daly. 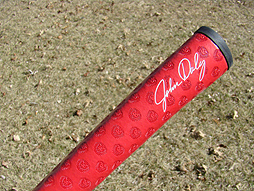 Note the initials "JD" and John's personal grip. Very rare. 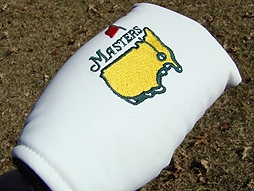 Made for the Masters and sold on the grounds of Augusta National. 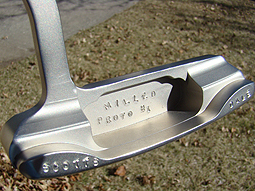 This is #18 of 50 and the putter sold out within minutes of release. 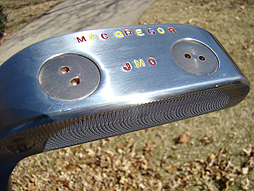 MacGregor putter made in 1960's bearing the name of Perry Como. 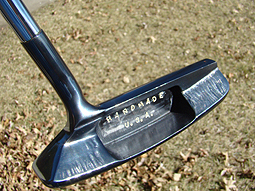 This is Model 144 and is in mint condition. 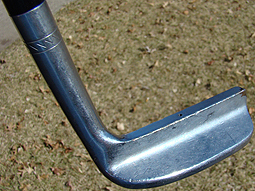 It still has the ball marker feature at the tip of the grip. 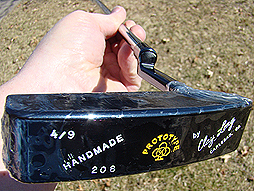 One of forty prototype, made to commemorate Jesper Parnevik's victory at Greensboro in 1999. 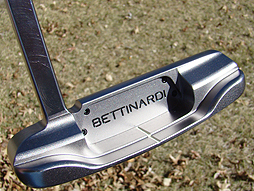 This was Bettinardi's first PGA victory. 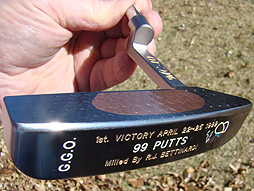 This model is called 99 Putts, as that is how many Parnevik used during his victory week. Also of note, is the caricacture of Parnevik smoking a victory cigar, as he did on the 18th green. 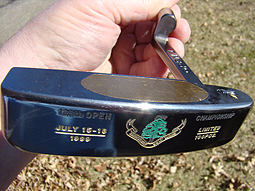 One of one hundred pieces made by Bettinardi in 1999 to commemorate the British Open at Carnoustie. This was, of course, the site of the historic Jean Van de Velde meltdown. 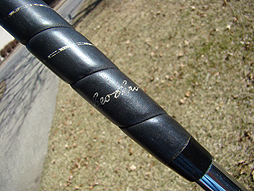 This is a handmade prototype made by Clay Long. 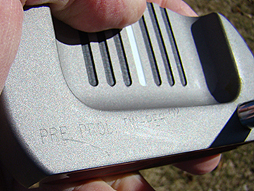 It features a RESPONSE style head with an aluminum insert which produces tremendous feel. 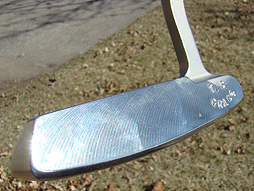 Clay, of course, has designed clubs/putters for MacGregor and Nicklaus for many, many years and designed the RESPONSE putter used by Nicklaus to win his final Masters in 1986. 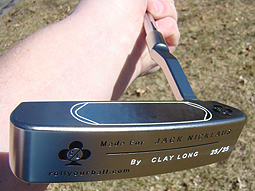 This is a handmade prototype made by Clay Long as part of a 25-piece run given to Jack Nicklaus for use. This one is #25 of 25. 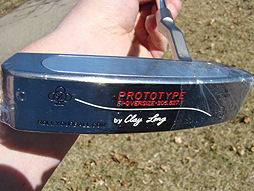 This is a handmade prototype made by Clay Long in 2008. 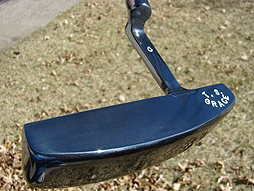 It is #4 of a 9-piece run and features a short slant neck and carbon steel head. 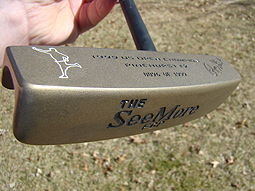 This is a special edition SeeMore made to commemorate Payne Stewart's final major victory at Pinehurst in the US Open. This one is #0096 of 1999 pieces made. 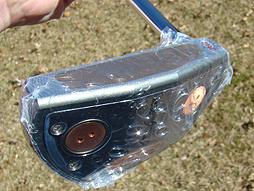 The first 100 were given out to players, friends and family of the PGA tour. 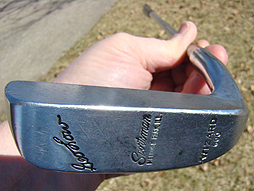 This is the famed George Low Sportsman putter made in about 1959. 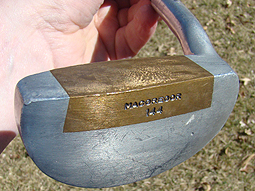 Supposedly about 200 of these were made and were used by the likes of Arnold Palmer and of course Jack Nicklaus to win the majority of his major titles. 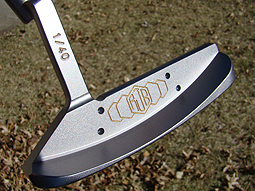 This one is one of only a couple to feature the logo being stamped sideways. 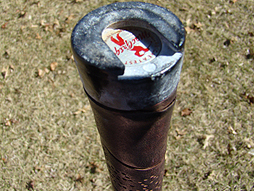 This is referred to as a "Sideways Sportsman." 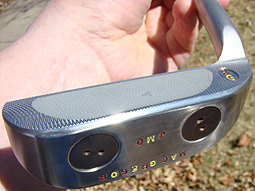 It also has a dot for sightline and rings around the neck. These are verified as being factory-completed by a letter on file from the Hansberger family, who owned Sportsman. 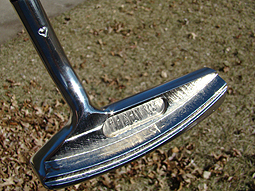 This very well could be the rarest of all steel-shafted putters. 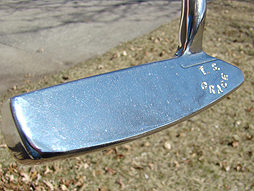 This is a Ram putter which is marked "Pre-production TW-PER" made for and played by Tom Watson. 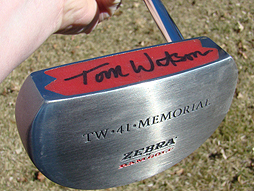 Signed on the face by Tom. NOT FOR SALE. 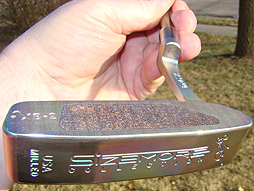 This is a Sizemore Collection putter with copper insert. 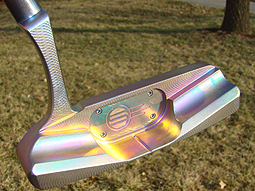 Bruce Sizemore has chemically treated the putter to produce the colorful effects shown.